In Archery Gobblers, John McClendon and Mike Whelan take you on one of nature’s toughest challenges, hunting gobblers with a bow and arrow. 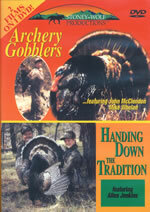 In "Archery Gobblers", John McClendon and Mike Whelan take you on one of nature’s toughest challenges, hunting gobblers with a bow and arrow. This feature will show you how to put crafty toms right in your lap. In the second feature "Handing Down the Tradition" renowned turkey hunter and caller Allen Jenkins realizes the importance of keeping the hunting tradition alive. Join him as he passes to his sons, true experiences of whitetail and turkey hunting. This is a must-see hunting video on DVD for all hunters!